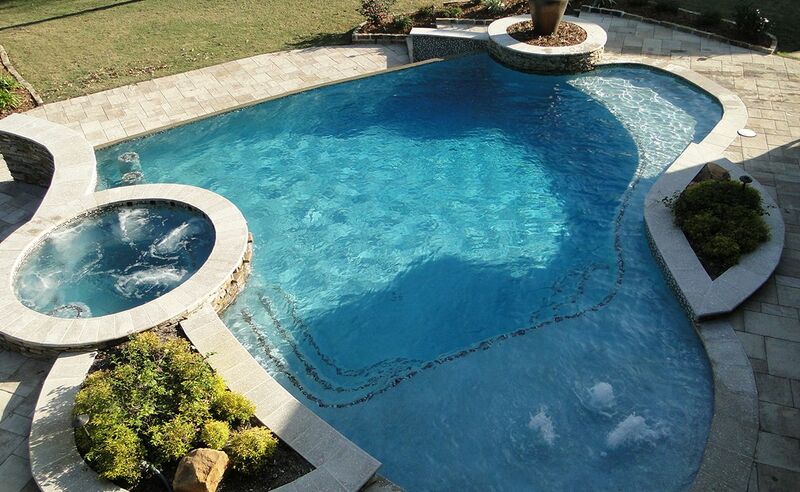 What Is the Right Pool Shape for Your Backyard? If you’re tired of looking out your windows and just seeing a plain, boring backyard, consider transforming it with a swimming pool and additional backyard amenities. Pools can come in shapes that are rather simple or they can be designed with a free form shape that could get quite creative. So, which pool shape is best for your backyard? The first thing to keep in mind is how your swimming pool will fit in your lot. Different properties have differently sized backyards. There is no best pool shape really. Your pool builder will help you explore the options available and work to find a way to fit the shape you want into your lot. Rectangular. Perhaps the most common swimming pool shape available and the easiest to build is the rectangular-shape pool. It’s considered a “no hassles” shape and intended for people who need a simple solution or who are looking to swim laps. This shape is the most appropriate for backyards with a simple lengthy geometric shape. Oval or round. If you hate angled corners because you feel they might be slightly dangerous, you can opt for an oval swimming pool or basic round. This kind of shape can be used as a spa, as well. You can also opt for semi-circles. These shapes work well for small backyards with limited space for customization. Bean. Also called kidney-shaped pool, a bean-shaped pool may be the one you need if you would like to have a retro look in your yard, as this shape is the most typical variant shape of pool four decades ago. It’s a great choice for dipping and plunging, but not for lap swimming. Yet, bean-shaped pools are typically rather appealing to children. Angles and corners. If you like a rectangular-shape, but not the angles and sharp corners, you can choose a mixed shape, depending on the variant that pleases your taste. Swimming pool customization is easy for pool builders, given you have enough space and you do not choose fiberglass pools since they are pre-built. The best suggestion for the mixed angles is a rectangle shape with rounded corners. If the sharp corners of a basic rectangle-shape pool are an eyesore, then you can soften the shape by having the corners rounded. Freeform. This kind of pool is the most flexible pool to build because it can work with your backyard and your landscape. Pool builders will have an easier time fitting the pool in your available yard space. With the freeform shape, you can express your style and theme based on your plans for your backyard. If you choose to integrate landscaping with trees and shrubs or make it look more formal, it will reflect your taste in design and personality. The best thing about freeform swimming pools is that they impose no rules on the shape and can be geometrically mixed of curves and lines. The downside of a freeform shape is that it will require a customized cover if ever you plan to have one. Also, the cost will vary based on how simple or complex your chosen shape is. Talk to Us at TLC Outdoor Living! As you can see, you can have a backyard pool that is as simple or complex as you’d like. Start building your fantastic pool with TLC Outdoor Living. Our team of expert pool builders will guide you on how you can best utilize your space and enjoy your swimming pool as soon as possible. You can have years and years of enjoyment with your own home resort-like spa with our luxury pools. At TLC Outdoor, we design and build your swimming pool to bring your vision to fruition. Contact us now and let us make the perfect pool for you!